THIS PAGE IS UNDER CONSTRUCTION as Names appear in the Letters. KATHLEEN BROOKES: Deaconess/ Sunday School Teacher/ Superintendent. St Paul’s Church, Walsall. Lived at Fernleigh, Mellish Road, Walsall with her father, William Henry Brookes, JP, in 1906. 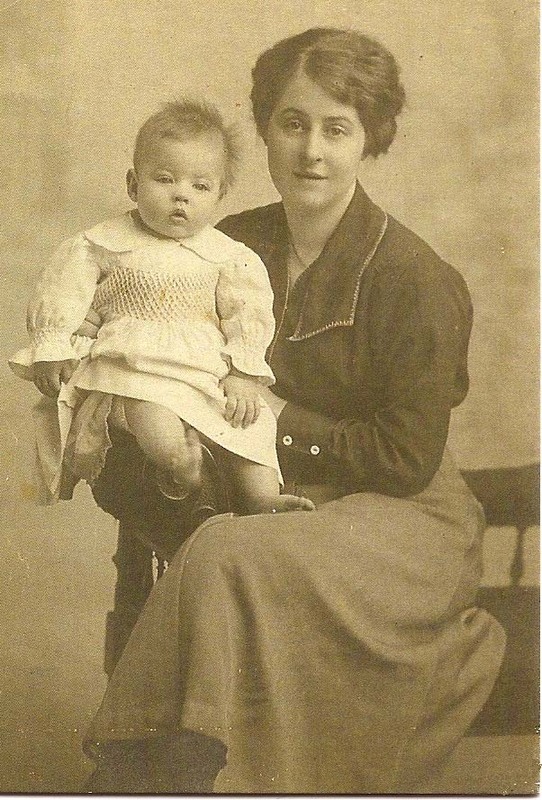 She was on the Prisoner of War Relief Fund, Walsall Ladies’ Health Society and Walsall Poor Children’s Holiday Society. WILLIAM BROOKES & SONS Ltd. were merchants & manufacturers, saddlers/ iron ironmongery, 9 Leicester St, in 1906. HENRY COZENS: Father of TIM COZENS see Soldiers Page. The Revd E. More DARLING: Vicar of Walsall. Kept up lifetime correspondence with Bertie. The Revd J.B. DIXON: Vicar of Ashton under Lyne ? (Born 21 April. Year unknown). Mr & Mrs Enoch EVANS : Hibbett Family Friends. Enoch Evans became Mayor of Walsall in 1917? VERNON EVANS: QMS OTC. Bertie’s Best Pal. Volunteered & trained together. Stayed together for most of their 16 months at the Front. Kept up correspondence for the rest of their lives. Vernon & his brother Enoch, became solicitors in Walsall. The FARRINGTONS, FENTONS, MIDDLETONS, HURSTS: Members of St Paul’s Church, Walsall. Mr HEMMING: Arthur Hibbett’s Secretary, Education Office, Town Hall, Walsall. Mr. E.N. MARSHALL: Headmaster Queen Mary’s Grammar School, Walsall. Recruitment PC to Hibbett family, 11th August. 1914. Mr & Mrs OVEREND: Hibbett Family Friends. LENA THACKER: Friend of Sydney & later of Basil. Dr. UTTING: Hibbett Family Doctor, cared for Ida in her final illness. Graves of both in Rushall Churchyard, nr Walsall. 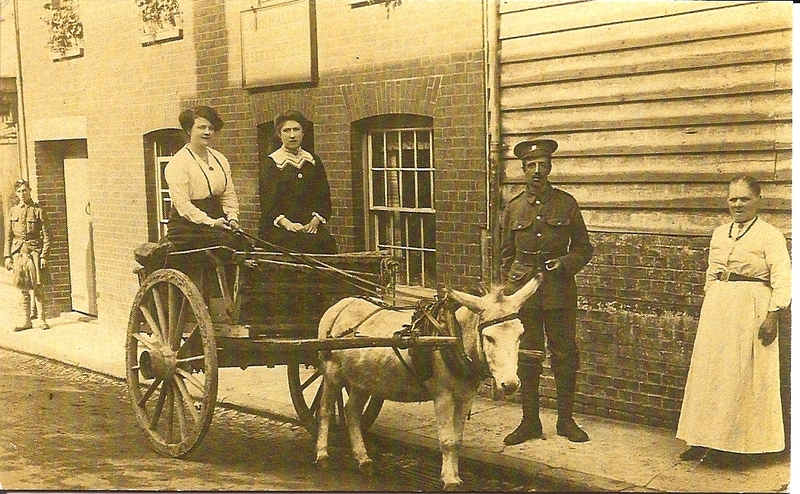 Mr WILLIAM FRANCIS & Mrs ALICE PENNING: 29, Gold Street, Saffron Walden. (Army billets for Bertie, Sydney, Vernon Evans and Norman Cope before embarcation to the Front). Their son, Corporal ARTHUR PENNING 29471 Royal Garrison Artillery, was reported Missing / Killed in Action, 20th Aug. 1915. Age 25. Buried Etaples Military Cemetery. (IV C. 2A). Alice Penning wrote a very moving little note to Bertie Hibbett’s Mother, as the boys left for France, Midnight, Feb 28th 1915. Bertie kept up with the Penning Family for several years after the War. PHOTOGRAPHS : Courtesy of Mrs K. Penning (nee Ketteridge, daughter of John Francis Penning, brother of William Penning, Bertie’s Landlord) & her son, Vaughan, Penning, 2001. Outside the Old English Gentleman Inn, Gold St. Saffron Walden. 1914. Far right: Grandmother Penning. Seated in Cart: (dark dress) Elizabeth Penning, sister of William Penning, (Bertie’s Landlord)..
ANNIE PENNING with Lesley, (Kathleen Penning’s future husband). THE PENNING FAMILY in 1939. Seated behind, left: Annie Penning; Standing far right, her husband John Francis Penning; kneeling in front, Kathleen Penning. Fascinating reading this account of Rev Arthur Hibbett’s experiences during WWI. I now live in Abergele in North Wales were he got his call up card. My father was in the army between 1916-18 and his diary mentions the South Staffs Reg being billeted with his family in Saffron Walden, my home town before he was called up himself. Incidentally, there is a photo of my grandfather, grandmother, father, uncle and aunt with four South Staffs soldiers hand bell ringing together in the book: Saffron Walden, a Pictorial History (Photo 174) by Everett & Newman. I would need permission from the authors to reproduce it for you, which seems strange as the photo must have belonged to our family at some stage. I’m glad to here that Arthur didn’t lose his faith like so many after the experiences they went through and went on to become ordained. I am glad you are enjoying my Dad’s WW1 Letters. He was particularly happy at Saffron Walden and might well have known the S. Staffords soldiers in your photo, as well as members of your family – he might even have been in your family home! I would be most interested to see the photo – as I am sure viewers of would be too. Yes WW1 strengthened & developed my father’s faith & his joy in life. His ability to relate to all sorts of people and minister to them as an Anglican priest was a direct result of his own experience of suffering in extremity. Many thanks for your contribution. It is always a joy to have feedback. I have just scanned the photo mentioned in my previous message. All I need to know now is how to send this to you as I cannot see an attachment icon. Please forgive my ignorance and I’d appreciate your assistance. Just a reply to your message regarding the photo I mentioned in the book on Saffron Walden. Did you manage to receive the email I sent with an attachment containing the photo? The Saffron Walden Historical society have seen your website but were under the misapprehension that my father was billeted in Walden, when in fact his family only hosted South Staffs soldiers. I was hoping relatives of the soldiers may recognise their kith or kin and we could put names to the faces. If my email didn’t reach you, I will try some other way of forwarding the photo to you. My father had an autograph book with names and either cartoon illustrations,or some uplifting or amusing message from some soldiers from the London Irish Rifles (L.I.R.) who were billeted after the South Staffs left. They also postfixed their name with LIR indicating their regiment and that they were soldiers. Unfortunately I can find no evidence that any South Staffs soldiers used the book or I would have their names to research them.